20th April: Details have been released of the Volvo Round the World Yacht Race in 2012. The Race will start in Alicante, Spain and will finish in Galway in the first week of July. Over all, the boats will cover over 39,00 kilometres in just under nine months of racing. The Race will also pass the Fastnet Rock off west Cork as it head for Galway. 10th March: It has been confirmed. 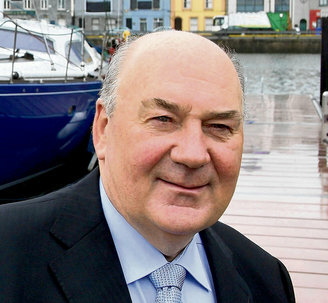 Galway is to be the finish port in the Round the World Yacht Race in 2012. Our Taoiseach (Prime Minister) announced the event today, in the company of organisers of the Volvo Ocean Race. The final prize giving ceremony will be held in Galway, the City of the Tribes, in what should be a memorable event for the City, the West and indeed for Ireland in 2012, a year after the Tall Ships grace the Waterford Quays. Hopefully Hooks and Crooks will be there again to entertain the people. See www.letsdoitgalway.com/press/news.php?id=151/ for further details. 4th March: L'Orient has been confirmed as the penultimate stop in the next Volvo Round the World Yacht Race. However, all is not yet lost for Galway as it competes with Amsterdam, Stockholm and Gothenburg for the final stopover, and the finish of the Race. The decision on who hosts the final leg will be made soon. 5th February: Efforts are afoot to bring the Volvo Ocean Race back to Galway in 2011/12 and the Government have committed four million euro to the bid, around half of what they committed for the 2009 event, so the balance will have to be raised from sponsorship, if the bid is successful. However, Ireland's bid is contingent on having a race entry, so the Green Dragon may race again though she would have to be more competitive next time round, which may be possible due to new rules. Extra weight could be added to the keel but the new rules state that if this occurs, that 50% of that weight must also be added to the hull. Lisbon in Portugal and L'Orient in France are also seeking to host the race. The outcome of the bidding process should be known in March 2010. Green Dragon Racing Team is part of the Let's Do It Global not for profit organization which was set up following Galway's successful bid to host the Volvo Ocean Race from 23 May to 06 June 2009. Its purpose is to co-ordinate the Volvo Ocean Race host port, an entry in the race and to build a long-term legacy from the project. See www.greendragonracing.com for up-to-date information on the progress of the Green Dragon as it powers across the oceans of the world. See www.volvooceanrace.org for details of the Race itself. 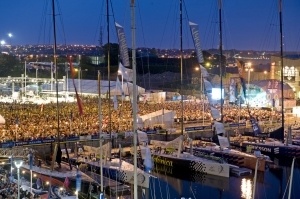 The Volvo Ocean Race Stopover in Galway from the 23 May to 6 June 2009 was a major success. There were 650,000 visits to the Race Village and Salthill and a TV audience globally of 1.3 billion people. A further 234 million people listened on radio. All this generated a massive economic boost to Galway with 55.8 milllion euro added to the local and national economy, around 35 million euro of which came from outside the local region. Green Dragon, the first bi-nation entry in the Race (Ireland and China were the major sponsors), achieved the highest return on investment, despite being one of the lower budgeted teams in the event. Most of the people who attended the event said they would recommend Galway as a holiday destination. For the record Ericsson 4 won the Race with 114.5 points and Green Dragon came 5th with 67 points. 24th May. The fleet arrived in Galway this morning, early! Let the fun and frolics begin. Galway here we come. 22nd May: The green dragon is powering its away acroos the Atlantic in strong winds and 5 metre seas. All the boats are within an hour of each other. All going well, the boats should arrive in Galway sometime on Sunday. 17th May: The fleet finally left Boston Harbour and is on the high seas for the penultimate leg of the Race. They should arrive in Galway within the week after 2000 miles of sailing across the Atlantic. 4th May: The boats are all up on deck, for a check-up and service. This means X-raying everything to ensure there are no cracks or breaks. The boats will be lifted by crane back into the water over the next couple of days for inshore racing around Boston Harbour next weekend. 25th April: As the yachts head for Boston Harbour, Green Dragon is is fifth place, with cooler water, stronger winds and a reasonable head sea and a decision to make as to how and when to cross the Gulf Stream. A high pressure ridge might complicate matters for all the crews. 13th April: It's day 2 of the sixth leg of the Race and the Dragon has left Rio for Boston, a journey of some 4,900 miles, initially close inshore in light winds, which means progress will be slow. When further north, the boat will catch the northeast trade winds before heading out into the Gulf Stream. Once out in the North Atlantic on the final run in to Boston, they have to avoid an exclusion zone, the breeding grounds of whales. It should be an eventful leg! 28th March, : Green Dragon crossed the finish line off Rio de Janeiro at 18.59.40 GMT today. Green Dragon now has 39.5 points after securing fourth place place on this long and epic leg. Ericsson 3's superb leg win has moved them above Green Dragon overall, but with 65 points still available during the next 5 legs and In Port races there are still plenty of opportunities available, and the crew are looking forward to arriving in Galway in May (only 6 weeks away now) in a good position. 17th March: it's Saint Patrick's Day and the Dragon is battling wind, rain and heavy seas as it rounds the treacherous Cape Horn. Happy Saint Patrick's Day from all in Waterford. 11th March: Week 22 and Leg Five from Qingdao to Rio and the Green Dragon is making headway towards Cape Horn, having finally crossed the halfway mark on this leg to Rio. The crew finished in fifth place just behind Telefonica Blue as they sailed under the wrong cloud at the wrong time which was the difference between fourth and fifth place. But the boat is still in touch with the fleet, as they were all within 80 miles of each other after 6,000 miles of sailing. They crossed the halfway mark on Sunday 8th March and they now have to try to steer away from two large icebergs, each about 60 miles long, which broke off the Antarctica about two years ago. 3rd March: The Green Dragon has sailed 4000 miles since it left China, and is averaging 300 miles a day so the remaining 7500 miles will take another 25 days of hard sailing, most of it in the treacherous Southern Ocean. There is no more than 40 miles between the 5 yachts as they head for the scoring gate in New Zealand, the first of two on this leg of the Race. The crew also managed to fly a spinnaker having encountered downwind sailing off Fiji. Meanwhile, back in Galway, things are hectic as organisers plan for the stopover there in May. 11th February: Preparations are well underway to host the Race in Galway where big crowds are anticipated at what should be a fantastic festival of fun, music and other events as well as boat racing and it should be the highlight of the year in the west of Ireland. Event organisers in Galway have categorically denied that the staging of the Irish leg of the Volvo Ocean Race would be moved to Cork. 10th February: The next leg of the Volvo Ocean Race from China to Brazil, all 11,500 miles of it, begins on Saturday 14th February. Meanwhile in-port racing has been beset by bad weather, this time dense fog and little or no wind and some races have been abandoned. Better news is that the Dragon was presented with the Seamanship Award for all the setbacks they endured and for overcoming them on the last leg. 3rd February: Green Dragon arrived in Qingdao, China on Saturday 31st January having completed the gruelling fourth leg of the Race. She is now in fourth position in the Race with 27.5 points, 17.5 points behind the leader, Ericsson on 45 points. It is literally all hands on deck now as the crew are working around the clock to repair the damge done by horrendous conditions encountered on Leg 4. 27th January: Horrendous conditions with winds of up to 45 knots and 10 metre seas resulted in structural damage to the Green Dragon in the last few days, with a broken bow (for the second time) and a crack in the internal bulkhead. Having had to seek shelter, some repairs were carried out and the boat is back out on the ocean with almost 1000 miles to go to China which is hoped will be reached before the next storm arrives at the end of the week. The whole fleet was forced either to anchor or to seek shelter to allow the sea conditions to improve. 23rd January: When 150 miles from the waypoint, Green Dragon suffered a broken forestay but the crew quickly eased sheets and secured the halyards to the bow to prevent the lost of the mast. Her sailing speed will be affected, which is a bitter disappointment as she was in fourth position which will now be difficult to improve on. 21st January. The Race left Singapore last Sunday for China for the next 2,500 mile leg of the journey and the Green Dragon is in third place. Conditions in the South China Sea will be difficult with winds of up to 50 knots generating a wind chill factor of up to -30 C making life difficult for crew out on deck. The Black Tide will also be a problem, an extremely strong current which runs up the east coast of Taiwan, where there are notorious shoals and reefs. All this ocean has to be sailed against the wind, which makes for an interesting leg. 23rd December: The Green Dragon was sixth into Singapore in the 3rd leg of the Volvo Round the World Yacht Race and is now 5th overall. The crew now have a well-earned rest for Christmas. 10th December: Leg 3 began on Saturday 13th December from Cochin, India to Singapore, a 2000 mile stage through areas of commercial shipping, piracy risk and possible light winds. This leg will probably take around 10 days and there are some crew changes among the 11-man team. 2nd December: The Green Dragon came seventh in the second leg and fourth overall in the Race. 28th November: The Green Dragon has slipped to 5th in the Race but there's a long way to go yet. 21st November: Despite the setback of the broken boom, the Green Dragon reached the scoring gate in third position and second overall in the Race (8 yachts are involved). The next stop in Kochi, India is 3000 miles away. 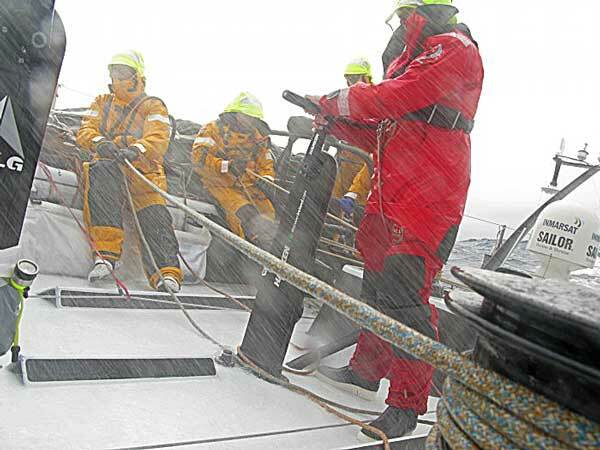 20th November: The Green Dragon broke a boom in severe sea conditions in the Southern Ocean and is now 7th in the Race. It had a podium finish at the end of the first leg of the Race, coming in third when the boats arrived in Cape Town on the 3rd November 2008.